Suddenly Nathan Fillion, actor, TV star, space cowboy, was a Twitter friend. Or so I thought. When the Fox TV series Drive first aired in April, I noticed Fillon was a Twitter-er, a participant in the social media, short-message service Twitter. 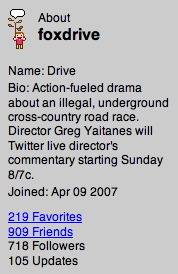 As it turned out, it was actually director Greg Yaitanes making the posts; he just used a Drive publicity photo (of Fillion) as an avatar. Didn’t matter. Fillion or Yaitanes, I had a connection with someone working on an interesting new program, someone who would “talk” with me and feed me — and 909 friends and 718 followers on Twitter — with insider tidbits about filming, scripts, special effects during the show. Fox may have been ahead of its time, not with the show (which it canceled) but with Twitter. The Wall Street Journal reported this week that NBC, CBS, ABC Family, and MTV are among several networks “experimenting with the marketing possibilities” of Twitter. As I discovered with Drive, there’s potential power between the network, the show, the people responsible for the show, and fans watching the show — if done right. Viacom’s MTV used Twitter to promote its MTV Music Awards June 3. Disney’s ESPN uses Twitter to send sports updates. ABC Family has launched a promotion around the new show Geek, a comedy-drama about frat and sorority life. The title character in NBC’s show Chuck, a computer geek who becomes a secret agent, also will twitter to fans. That’s all fine and dandy, but marketing through Twitter isn’t a guarantee. Twitter is still a small community, drawing 370,000 unique visitors in June in the U.S., according to comScore Media Metrix, which will not say how many people use the web application. Twitter-ers tend to be young, tech-savvy and use the service as a way to “talk” to friends, to update people on their lives, to share links and information, in short, 140-character bursts. They’re also connected to others through social sites such as MySpace and Facebook. One word of advice, though. Treat us Twitter-ers with respect. Actively participate during the show’s season. Post more than once a week. And when you take a hiatus, let us know.